During interrogation, Kumar said that his wife Mahadevi was forcing him to commit the crimes and that she had set a target for him. BENGALURU: Kengeri police on Monday arrested Mahadevi (29) on the charge of instigating her husband Achyuth Kumar, a notorious chain snatcher, to commit the crimes. 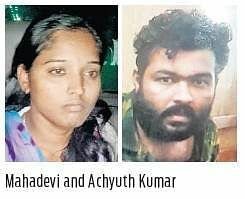 Kumar was involved in more than 100 chain-snatching cases and Mahadevi had given him a target of a minimum of three chains to be snatched daily. She wanted to make easy money and soon after Kumar was arrested she went absconding from an orphanage at Nagamangala in Mandya district. Police said that in June this year, Kumar alias Vishwanath Koliwad (31), a resident of Kaniminike, Kumbalagodu, was arrested after a long chase at Jnanabharathi. During interrogation, Kumar said that his wife Mahadevi was forcing him to commit the crimes and that she had set a target for him. She would collect the gold chains from him after the crime and even helped him pledge the chains at pawnbroker shops to earn quick money. Kumar had snatched gold chains worth `1 crore in the past seven months and was involved in cases in Davangere, Dharwad, Haveri, Gadag, Tumakuru, and Bengaluru. Investigation revealed that Mahadevi was addicted to buying costly vanity bags and would often go to Goa on vacation. She had even purchased a weighing machine to measure the exact value of the gold chains and also bargained well with pawnbrokers. She even forced Kumar to buy two SUVs and five bikes. She used to spend time in posh hotels during their trips, the police officer said. The duo was married for five years, the police claimed. Constable Chandra Kumar, attached to Jnanabharathi police, chased Kumar alone and was attacked with a knife. Meanwhile, senior police officers swung into action to nab Kumar by firing at his leg. City Commissioner T Suneel Kumar had announced a reward of `1 lakh for constable Chandra Kumar.